Today we're releasing Polarr Photo Editor 4.0. This is a big update that introduces a handful of powerful new additions. We've revamped the Face tool and Color mask to make them better than ever. Joining the app is a useful new Spot removal tool and Liquify tool. Plus so much more! Let's talk about all the changes in this update. Android and iOS users will find the update in their respective app stores, while Mac and Windows users will see in in the next week or two. Face tool. Better. Faster. Stronger. The above features are pretty powerful and make the Face tool better than ever. So let's give a quick overview of these features. Prior to this update, Polarr would be able to automatically detect a single face in your photo. We're now able to do more than one. This might seem like a small update, but anything that improves your workflow and saves you time is huge to us. With just a few taps you can adjust the facial expression of the subject in your photo. Move the slider to make them frown or smile. A new editing option gives you control over the highlights or shadows in the skin. These adjustments are a great way to edit portraits to truly pop. This update introduces the ability for you to adjust a few facial dimensions. We've included controls that make it easy to change face width or the height of the chin or forehead. These new features in the Face tool are a great way to compensate for certain lenses that might distort the dimensions of a face. In the Face tool, you'll find a panel for Spot removal. This panel includes two tools you're going to love: the Healing tool and Cloning tool. Use the Healing tool anytime you want to sample a part of an image and blend in into another section. Perfect for hiding spots on a face. The Clone tool works great when you want to literally clone a small selection into another section of your image. Together these tools are great for more than just faces but can be used in all image types when you want to remove any sort of spot. The new Liquify panel is where you're going to go if you want to distort your image. We've included a Warp tool, Pinch tool, and Bulge tool. You'll notice the Color mask looks a little bit different from before. This update adds a color picker so you can select the exact color you want to mask. Once selected go ahead and change the range or bring up the radius tool like in the previous updates. You'll quickly notice our app icon is new and improved. We've also updated all icons within the app to better communicate what they do. A small addition, but one welcomed by our pro users. When you enable the watermark it will now show up for all photos on the screen. In the Polarr Store, we've given you the option to try out Polarr Pro features for 2 hours. 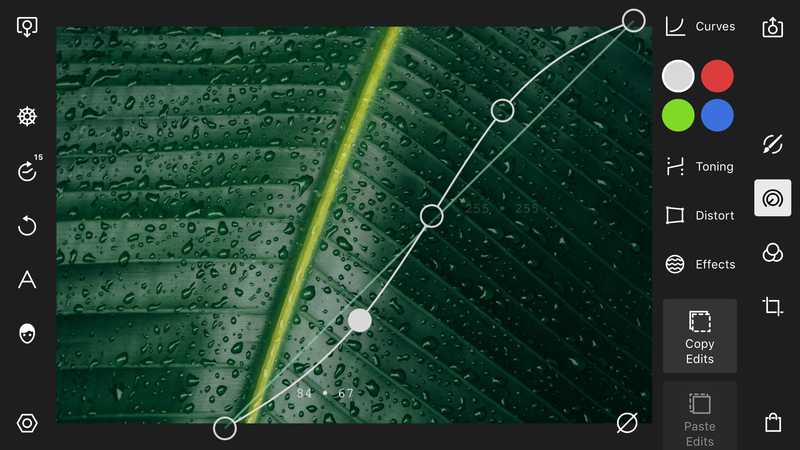 Basic editing tools are free in Polarr, but for the advanced stuff, you're going to need to go pro. Some advanced features unlocked for Polarr Pro users include Masks, Face tools, Text tools, Denoise tools, batch exporting, and more. You'll notice the Filter panel looks quite a bit different when you're selecting a filter. We improved the layout to make it easier to go between categories. The filters themselves have been improved and should look a lot better! Let us know what you think. The UI when you use the Curve tool makes it easier to use with a larger area to interact with. We moved the Curve tool to the middle of the image when editing so it should be easier to use when you're on mobile. Every update we release contains a variety of bug fixes and performance improvements to make the app better for you. Watch the video above to basically get a visual version of this post. Neat huh? For more Polarr, follow us on Twitter or Facebook for the latest info. Let us know what you think of this new update.